In 1911 San Francisco was in shambles, not only from the great earthquake and fire, but from years of graft and corruption by Major Eugene Schmitz and his string-pulling, party boss Abraham Ruef. Into the ruins stepped a remarkable man, James 'Sunny Jim' Rolph, who would eventually serve five consecutive terms as mayor and leave as San Francisco's most beloved political figure. Sunny Jim, later called 'The Mayor of All the People' was born in the Mission District, made his fortune in the shipping business, and gained popularity as the head of the post-earthquake relief committee. Sunny Jim had a flair for the dramatic, always wearing cowboy boots, a black cutaway jacket, a black pearl in his cravat, and a carnation in his lapel. In many ways his cheery personality mirrored the live-and-let-live city. His good-natured administration took a relaxed stance on the city's tradition of vice. Prohibition enforcement wasn't a priority and his campaign promise to 'clean up' the brothels meant compulsory medical checks every four days rather than shutdown. When Communists protested City Hall, he invited them in for a chat instead of calling the police to club them down like in other cities. Under his administration San Francisco rebuilt and blossomed, the Municipal Railway was started, work began on the city's Hetch Hetchy water system, and the Pan-Pacific Exposition was held. But his most proud achievement was the construction of a stunning new City Hall, 30 feet taller than the U.S. Capitol. Sunny Jim Rolph's governing philosophy was best summed up by his quote, "You must think of the city as your best girl and treat her well." I have to admit that I am very sad to be one post away from the end of this website. I've been following it for almost 2 years now, and it has kept me connected to the city I love so much. Thank you for all of your work, your insight, and your encouragement for people to discover the hidden secrets of San Francisco. I will definitely be following your new site, and I wish you all the best of luck. Margo: Thanks, I appreciate you visiting over the last two years. I hope I highlighted some things in San Francisco that you hadn't seen before. 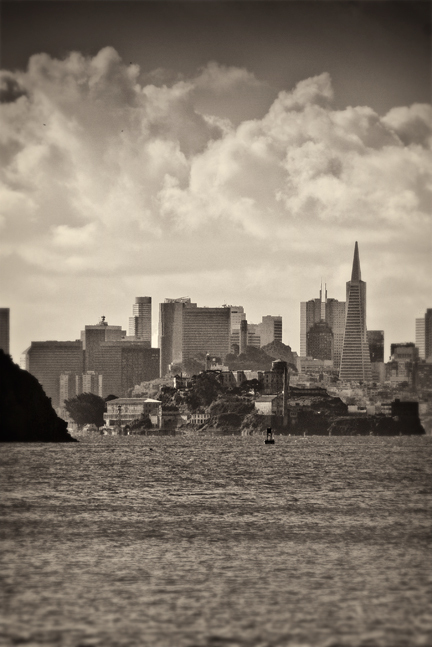 APAD: The reason it looks unusual may be because it was shot from a beach on Angel Island. I'm glad to hear that we've always had our laid-back view of the world and life. As for the announcement that fogbay was ending I was really disappointed until I read that you'll still be posting pictures at another site. I'll follow that, and in the meantime I have the better part of a thousand posts to get through :) I think your site is quite literally one of the best photoblogs on the internet and and your mix of photograph and our city's lore has made it a pleasure to read. I can see why the city doesn't appear to have a street named after Schmitz, but I can't believe we don't have anything famous named after Sunny Jim, considering all his stunning accomplishments. It's hard to believe that one man left such a lasting legacy; he is a true visionary.